(Nanowerk News) A new kind of information processing technology inspired by chemical processes in living systems is being developed by researchers at the University of Southampton. Dr Maurits de Planque and Dr Klaus-Peter Zauner at the University’s School of Electronics and Computer Science (ECS) are working on a project which has just received €1.8 from the European Union’s Future and Emerging Technologies (FET) Proactive Initiatives, which recognises ground-breaking work which has already demonstrated important potential. Sketch of artificial wet Nneuronal networks. The project, entitled Artificial Wet Neuronal Networks from Compartmentalised Excitable Chemical Material, which is being co-ordinated by Friedrich Schiller University Jena with other project partners, the University of the West of England, Bristol and the Institute of Physical Chemistry, Polish Academy of Sciences, Warsaw, will run for three years and involves three complementary objectives. 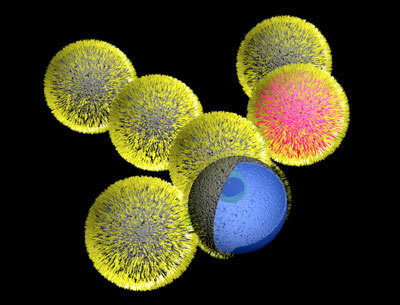 The first is to engineer lipid-coated water droplets, inspired by biological cells, containing an excitable chemical medium and then to connect the droplets into networks in which they can communicate through chemical signals. The second objective is to design information-processing architectures based on the droplets and to demonstrate purposeful information processing in droplet architectures. The third objective is to establish and explore the potential and limitations of droplet architectures. “Our system will copy some key features of neuronal pathways in the brain and will be capable of excitation, self-repair and self-assembly,” said Dr de Planque.